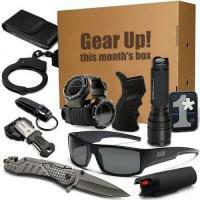 This is the monthly subscription box that gets you the latest gear with savings of up to 60%. Every month our experts put together a box that is guaranteed to blow you away. These aren't cheap samples or last year's leftovers. This is the real deal, and now is your chance to join the first buy club of its kind! The Standard Box Monthly Gear Subscription gets you 3-5 hand selected items from some of our best selling brands like Safariland, Blackhawk, Smith & Wesson, 511 Tactical and more! The Pro Box Monthly Gear Subscription gets you the same 3-5 items with an additional 1-2 premium items. Every monthly pack is guaranteed to far exceed the retail value if purchased separately. Let us keep you outfitted with the latest gear, all you have to do is make it look good! By ordering, you are authorizing CopsPlus Inc. to charge a monthly fee for your box subscription. Your subscription will auto-renew until you cancel. There are no contracts and you can cancel anytime. FREE SHIPPING OFFER DOES NOT APPLY TO THE SUBSCRIPTION BOXES. I was honestly skeptical about this purchase because I didn't much care for the idea of someone else choosing products for me. However, I was very surprised when I received my order. The box contained a lot of high quality products gray hooded sweatshirt, Under Armour backpack, Bell Howell LED lantern, Hogue pistol grip, and other items. I did research and discovered the items added up to over 150.00 The CopsPlus team obviously know what products their customers want. I will definitely purchase again Honestly, the best part was opening the box. I felt like a kid again on Christmas morning not knowing what was inside. Bought this for my husband for his birthday and he was extremely pleased with the box. Great gear, very happy. Worth the money and cant wait to see what comes next month. This box is Much better than any of the other options. I was very happy with the items I received. I can't wait for the next box. It wasn't what I was expecting. But a very pleasant suprise. Will continue my order. Definitely a cool monthly thing to show up at your door. I can't wait to get mine month to month. Love this, these boxes never disappoint. Is the subscription price an annual or monthly fee.